The f eel good bar is really a comfortable size for men and women. I love how the raised "FEEL GOOD", does make you feel good after a long day. Makes a great massage bar, easing away the day's tension. A must try. 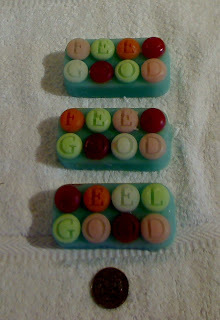 Another guest size soaps. 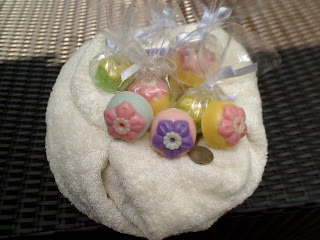 These cherry blosooms come in three all time favourite fragrances, lemongrass (yellow and green), lavender (purple and pink) and baby fresh (ok, maybe you have not heard of this one but trust me, when you walk past it, it smells like someone has just stepped out of the shower). Baby fresh comes in baby pink and blue or yellow.